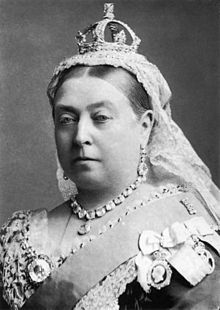 Victoria (Alexandrina Victoria; 24 Mey 1819 – 22 Januar 1901) wis Queen o the Unitit Kinrick o Great Breetain an Ireland frae 20 Juin 1837 till her daith. On 1 Mey 1876, she adoptit the addeetional teetle o Empress o Indie. Victoria wis the dauchter o Prince Edward, Duke o Kent an Strathearn, the fowert son o Keeng George III. Baith the Duke o Kent an Keeng George III dee'd in 1820, an Victoria wis raised unner close superveesion bi her German-born mither, Princess Victoria o Saxe-Coburg-Saalfeld. She inheritit the throne at the age o 18, efter her faither's three elder brithers haed aw dee'd, leavin na survivin legitimate childer. The Unitit Kinrick wis awreidy an established constitutional monarchy, in that the sovereign held relatively little direct poleetical pouer. Preevatly, Victoria attemptit tae influence govrenment policy an meenisterial appyntments; publicly, she becam a naitional icon that wis identified wi strict staundarts o personal morality. Victoria mairied her first cousin, Prince Albert o Saxe-Coburg an Gotha, in 1840. Thair nine childer mairied intae ryal an noble faimilies athort the continent, tyin them thegither an earnin her the sobriquet "the grandmither o Europe". Efter Albert's daith in 1861, Victoria plunged intae deep mournin an avoidit public appearances. As a result o her seclusion, republicanism temporarily gained strenth, but in the latter hauf o her ring her popularity rekivered. Her Gowden an Diamond Jubilees war times o public celebration. Her reign o 63 years an seiven months wis langer nor that o ony o her predecessors, an is kent as the Victorian era. It wis a period o industrial, cultural, poleetical, scienteefic, an militar cheenge within the Unitit Kinrick, an wis merked bi a great expansion o the Breetish Empire. She wis the last Breetish monarch o the Hoose o Hanover. Her son an successor, Edward VII, ineetiatit the Hoose o Saxe-Coburg an Gotha, the line o his faither. 24 Mey 1819 – 20 Juin 1837 Her Ryal Highness Princess Alexandrina Victoria o Kent. 20 Juin 1837 – 22 Januar 1901 Her Majesty The Queen. This page wis last eeditit on 5 Mey 2018, at 22:40.